Crochet book reviews. Fashionable crochet patterns. Below are reviews of some of our favourite crochet books. We'll be adding more books over time, so keep coming back. Bold use of black filet crochet over a white background produces a modern twist on crochet cushions. My favourites are the Hummingbird and the Finches. The book contains 9 patterns for 14"/35cm square cushion covers using size 10 bedspread weight cotton thread. All the patterns are rated as Easy. Full instructions are given including how to follow the charts and how to make a fabric pillow form (or you can just buy a suitable insert). Top down construction has long been popular with hand knitters. Now Dora Ohrenstein is applying the technique to hand crochet. Top down crochet allows for the garment to be tried on as it is worked. This collection of 14 fashionable patterns is sure to have something to suit everyone. The book contains detailed instructions on how to adjust the patterns for the perfect fit for your body shape. 35 stylish ways to keep warm from lacy shawls to chunky throws. This book is a real bargain. Snap up a copy while you can. This pattern collection has been really well received by crocheters. The instructions are clear and easy to follow. Another great feature is that yarn substitution is made easy for many of the patterns. Simple but stylish projects that will suit the beginner or anyone who wants some simple but modern crochet designs. I especially liked the glove and hat patterns. The homeware items are also very stylish. The book also contains a couple of patterns for felted crochet items - a stylish bag and an unusual scarf. There is a useful 'how to' section at the front of the book. The book uses UK crochet terminology. I love the extremes of crochet. Thick stiff fabric for bags and homewares or ethereal, wisps as light as a feather. The crochet patterns in this book are definitely at the light and floaty end of the scale. The designs are beautiful. Show stoppers but still very wearable. 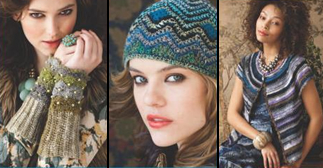 The 20 patterns include fantastic shawls, cardigans (such as the Petal Wrap cardigan shown on the cover), hats, scarves and tops. There are some quicker crochet projects in the mix too.The patterns also give you a chance to branch out into different areas of crochet such as Tunisian crochet and broomstick crochet. As with all Interweave books there is helpful 'how to' information. Uses US crochet terminology. Fantastic use of colour makes these designs really stand out. The book includes patterns for homewares and accessories including blankets, cushions, bags and scarves. The patterns give the yarn weight and fibre blend to help you find the perfect yarn for each project. This book is tremendous fun. Taking the world of Jane Austen as it's inspiration it delivers some rather romantic crocheted designs. Designs range from a delicate crocheted necklace to garments with some unusual design elements that give a real flavour of the era. The book includes crochet patterns range for accessories, homeware items and garments for adults and children. The Jane Austen trivia and quiz questions that are sprinkled through the book made it an ideal gift for any crochet loving Jane Austen fan. A lovely book that will provide a fund of beautiful crocheted gifts for new babies. Vita Apala is known for her stylish crochet patterns for children, always accompanied by sumptuous photos. Clear explanations and photo tutorials add to the appeal of the book. 18 different crochet master classes from 18 different crochet experts. The techniques are illustrated by patterns that utilise your newly learnt techniques. Learn woven crochet, hairpin lace, tapestry crochet, aran crochet, entrelac crochet, overlay crochet, Irish crochet and much more. A fabulous addition to your crochet library and a fantastic gift idea for anyone who loves crochet. Custom Crocheted Sweaters by Dora Ohrenstein. Make crocheted garments that really fit you by adapting crochet patterns to suit your body shape. If there is a frustrated crochet designer in you trying to get out then this book will help. Custom Crocheted Sweaters is getting glowing reviews everywhere. It also contains 10 original patterns to get you started including a shrug, cardigans a vest and a lovely open motif tank top. If you fancy trying some different crochet fibers, then this is a great place to start. The book contains 25 projects using natural yarns such as sisal and hemp. It also uses alternative fibers such leather twine. There are also some felted (fulled) crochet patterns too. Some of the projects involve some sewing as they combine fabric and crochet elements to great effect. Uses US terminology, but it does have a 'how to' section and a table of US vs UK crochet terminology. Good diagrams and clear explanations. The book is pocket sized so you can throw it in your work bag and never get stuck again. It covers all the basics from making stitches, working in rounds and increasing/decreasing to working with colour. It also covers more advanced stuff such as adding beads to your crochet, making stuffed crochet buttons, tunisian crochet and double ended crochet. Uses US terminology, but it does have a table of US vs UK terminology. It's a sad fact that there are more knitting patterns than crochet patterns. Seeing a lovely pattern and then realising it it knitted not crocheted can be frustrating. This book will help redress the balance. It gives a comprehensive guide to achieving a similar look and drape to various knitting stitches but using crochet. There are projects included in the book, but the book is really best for the inspiration it will give any budding crochet designer. 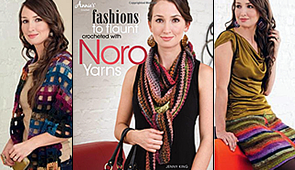 30 patterns to get you hooked on Noro yarns. Beautiful photography. This would make a good gift for any one who loves colour and crochet in equal measure. 6 garment patterns, the rest of the patterns are for accessories. This book contains 17 crochet patterns, 6 garment patterns, the rest of the patterns are for accessories. If you'd like to have more colour in your crochet but don't feel ready to tackle colourwork, then this could be the answer.